A dorm essential for cleaning up at the beginning and end of the college year and for every mess in between! Dorm Co. Tip: Keep extra on hand for cleaning at the beginning and end of the college year! You're probably planning on eating some meals in your college dorm room, whether it is a quick snack or a full meal. If you plan on eating in your dorm room, you will of course have dorm dishes, silverware and food storage. These dorm items are of course not disposable, so you will have to clean them. What are you going to clean them with? Don't use your dorm washcloths that you use on your face! Keep our 4 Pack of Sponge Scouring Pads handy! 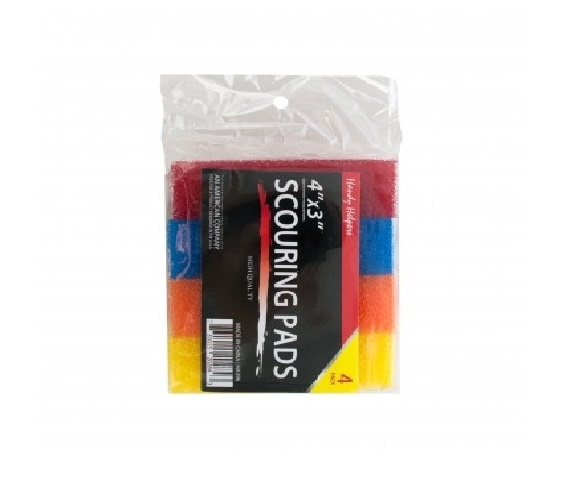 Our 4 Pack of Sponge Scouring Pads is a dorm essential that you will want to have plenty of. It's good these Sponge Scouring Pads are so compact because you can have as much as you want or need and they won't take up much dorm room storage space! Of course these college sponge scouring pads are a dorm essential for more than cleaning your dorm dishes- use them for cleaning your dorm room, too! This is especially important on move in and move out day- you don't want to unpack your college supplies and put them away in a dorm dresser or closet that isn't clean. Plus if you plan on keeping and reusing these dorm sponge scouring pads, you can color coordinate- one color for dorm room cleaning and one color for washing dishes. Just remember is which color you used for which purpose- you don't want to use your dorm cleaning sponge for your dishes!